The Khoruysa Brimia in all its glory! I’m a sucker for asymmetrical designs, so I wanted the main ship to have a pretty unusual look to it while still looking like an actual freighter. The elongated form consists of the cargo holds, which, for obvious reasons, make up the bulk of the ship. The living quarters are housed in the much smaller area surrounding the cockpit. And the guns are to blast any space geese that might pose a threat to the ship in motion. 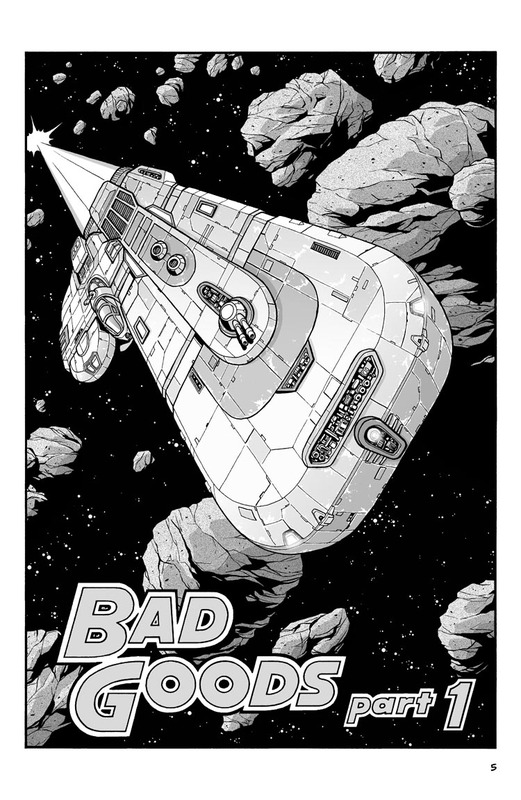 As for the title, “Bad Goods,” I love doing titles with double meanings. In this case, the “bad goods” refer to the questionable cargo they’re moving in this particular arc. But it also refers to the main cast of characters themselves, as they’re relatively decent folk in a very shady line of work.